For the third year in a row, Kentucky’s real estate market set new records in a number of areas despite inventory issues that kept many buyers on the sidelines for much of the year. Total home sales reached in 2017 were the highest ever recorded in the state at 53,058, a 1.8 percent increase over the 52,129 sold in 2016. 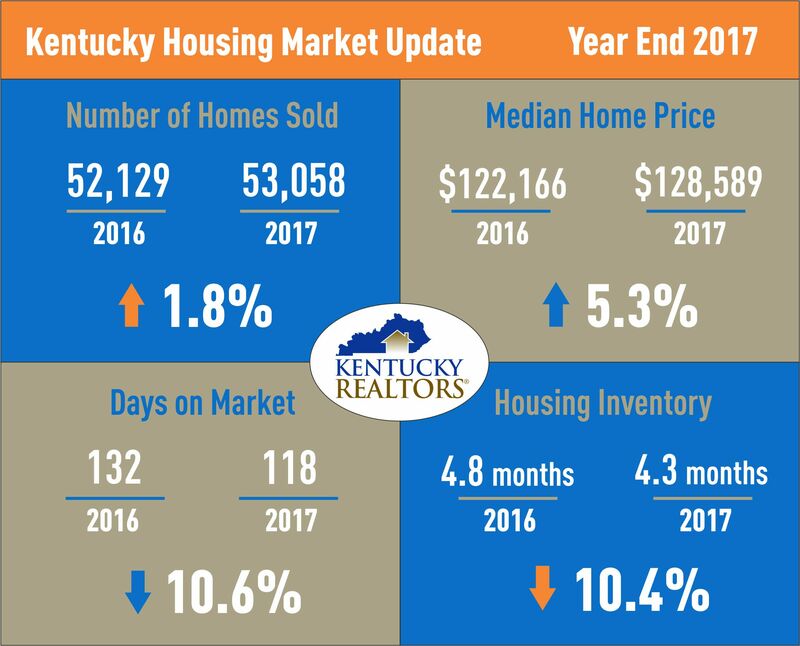 Kentucky REALTORS® (KYR) reported that over the past six years, home sales increased monthly, year-over-year, in all but 12 months. However, the lack of available inventory finally caught up with the market as year over year sales declined in three of the last four months in 2017. In the fourth quarter of the year, home sales saw an overall decline of 2.8 percent, dropping from 12,592 in 2016 to 12,242 in 2017 as November and December both posted decreases in properties sold (down 4.2 percent and 5.9 percent) while sales increased 1.8 percent in October. The inventory of homes on the market, according to realtor.com, is at its lowest level in at least two decades which has continued to push prices up across the state. The median price in Kentucky jumped to $128,589 for the year compared to $122,166 for 2016, an increase of 5.3 percent and a record high for a year. For the fourth quarter of 2017, the median price increased 11.4 percent over 2016, reaching $133,805. Each of the last three months of the year saw record breaking median prices with December hitting $134,274 in 2017 compared to $121,310 in 2016, an increase of almost 11 percent. The increase in home prices for Kentucky was still below the national median home price of $221,500. In December, Kentucky’s median home price climbed to $120,910, another record for the state. At the end of the year, housing inventory across Kentucky in December was up 2.4 percent from 2016, hitting 4.3 months and up 5.4 percent in November 2017 versus the same month the prior year. The fourth quarter closed out at 4.4 months of housing inventory which was even with 2016. In Kentucky, the rising inventory trend will help the real estate market continue to thrive, however, nationally, the inventory of available homes fell 11.4 percent in December to 1.48 million, and is now 10.3 percent lower than a year ago. Across the country, the housing inventory has declined year-over-year for 31 consecutive months and is currently estimated at a 3.2-month supply, the lowest level since the National Association of REALTORS began tracking this data in 1999. Six months of inventory is considered a balanced market. Days on market (DOM), an indicator that shows housing demand, dipped 10.6 percent to 118 days in 2017. In December, DOM dropped to 111 days, a 12.6 percent change from December 2016. In the two largest metro areas in Kentucky – Lexington and Louisville – days on market are down under two months for the year. Total volume of all homes sold in Kentucky broke the $9 billion mark for the first time in 2016 and nearly hit $10 billion in 2017 with $9.8.3 billion in sales, a 7.1 percent increase for the year. Kentucky REALTORS is one of the largest associations in Kentucky. Founded in 1922, Kentucky REALTORS represents more than 10,800 REALTORS who are involved in all aspects of real estate, including residential and commercial real estate brokers, sales agents, developers, builders, property managers, office managers, appraisers and auctioneers.